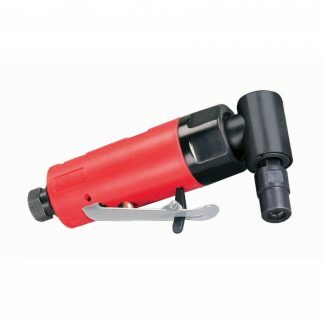 • Dynabrade .4 hp (298W) Die Grinder series, with extension models for reaching into previously inaccessible areas! Offering extended shafts of 3" (76 mm) or 6" (152 mm), these tools allow efficient finishing within deep work-piece channels and difficult passages! • Ideal for rapid material removal, deburring, deflashing, surface preparation, cleaning, finishing and polishing. Models accept optional carbide burrs, abrasive stones, mounted wheels and molded abrasives. • Shaft diameter of only (3/4") 19 mm fits into narrowest of areas! • Governor-controlled motor maintains speed under load. • Ergonomic tool housing with comfortable soft-touch grip. Safety-lock throttle lever prevents accidental startup. The Dynabrade 43510 6" (152 mm) Extension Die Grinder, Non-Vacuum is a Dynabrade tool within the Die Grinder category of tooling range. Spindles of can be used which can also be supplied by DynaShop. A Non-Vacuum tool with a maximum RPM of 25000, a power rating (hp/W) of 0.4 (298) with a weight of kg. Please complete the form below to arrange a tool demonstration for the Dynabrade 43510 6" (152 mm) Extension Die Grinder, Non-Vacuum or any of the Dynabrade range of tooling. Alternatively please call us on 01273 468736. Vibration readings for the Dynabrade 43510 6" (152 mm) Extension Die Grinder, Non-Vacuum are dependent on a number of factors that include the abrasive being used, the job in hand and operator experience. DynaShop or Dynabrade cannot be held responsible for the consequences of using the listed values for risk assessment, rather than actual values unique to each situation. Simply fill out the form below and the vibration data for the Dynabrade 43510 6" (152 mm) Extension Die Grinder, Non-Vacuum will be sent to your email automatically.